At the Open University in Scotland "openness" is part of our sense of self; our engagement with Open Educational Resources and Practices (OER/OEP) seems obvious. In this paper we explore some of those obvious aspects and using our partnership with a third sector organisation explore some of the less apparent aspects of openness. In addition to an account of the development and design of a suite of learning resources, the paper also reflects on how those resources have been used in practice, and the ways the design process has informed future developments. In doing so the paper attempts to be open and honest about the practice of openness in partnership. The paper is based on a partnership with a third sector organisation Community Energy Scotland (CES). It is funded by the Scottish Government to support and administer funding to community groups interested in energy and sustainability. Some of these communities take forward large scale commercial renewable energy projects, the majority are interested in improving the energy performance of local community facilities - "facilities projects". This paper concerns the development and piloting of a suite of learning resources to support those facilities projects. In particular it looks at the opportunities that openness in partnership presents for HE providers. As an open and distance learning institution it is "normal practice" for us to think about access in relation to a wide range of factors. Open educational partnerships create new questions and new challenges that disrupt our ideas of open practices and the idea of OEP more generally. Some are around the different needs of partners and learners, in particular how that informs pedagogical design, and some around what 'open' means in partnership. Finally, the paper looks at how the materials have been used, and what the development of them has "taught us" about future partnerships and open practices more generally. For an open and distance learning provider like the Open University (OU) in Scotland "openness" is part of our sense of self, we are "open to people, places methods and ideas" (Weinbren 2012). Thus our engagement with Open Educational Resources/Practices (OER/OEP) seems obvious (Gourley and Lane 2009). The open narrative on which the OU was founded is about open access, lifelong learning, first and second chances, and promoting social justice. Clearly there is an overlap between open practice in ODL and the open practices in OEP, however there are also ambiguities and uncertainties around those different practices. In this paper we suggest those ambiguities and uncertainties may be useful. The paper explores what they mean for the OU in Scotland through a case study of a partnership with a Third Sector organisation that supports community groups developing renewable energy projects. What OEP means in practice and for practice is explored in relation to what it means in partnership. The paper begins with an overview of openness and open educational practices more generally, then looks at partnership and the partnership in question. The paper then takes a practical look at learning design. It looks at the role of context, sector and partnership in shaping the form and function of the materials. Having explored the benefits of developing open content through partnership the paper examines some of the risks and how lessons that we have learned through the work have informed future developments. As an open and distance learning institution a multi-dimensional sense of openness and access is "normal" practice. For example, recent work on rural learning highlights: the way geographic factors layer and accentuate factors that exclude learners from education; and how digital connections reconfigure spatial relations accentuating the comparative advantage of connected rural learners, but at the same time making them feel excluded in comparison to urban learners (Macintyre and MacDonald 2011). Applying this institutional habit of understanding the open in the OU, as complex and multi-dimensional and relational, to OEP is instructive. In particular in relation to the altruistic reading of OEP - this focuses on the emancipatory nature of OER as a way to break down barriers to HE access for students. This "social justice" perspective highlights the ways freeing up knowledge benefits those people who might not otherwise be able to access education (dos Santos 2008). However, the altruistic narrative can be difficult to sustain as resources are only free and accessible to a point (Lane 2012). For example, the medium of exchange (the internet) has transactions costs for the producer and the consumer (Willems and Bossu 2012). As HE institutions have "freed up" their content, or created new OER (some altruistically, some for self interest) the proliferation of content has itself led to accessibility issues around the storage and the find-ability of relevant and appropriate content (Olcott 2012); and also access issues around provenance/trustworthiness (Masterman and Wild 2011). Alongside this are the ways that the OU understands open and the things that might restrict the freedom to access or use content that is on the surface open (Lane 2009). Solving all these accessibility issues is not cost neutral. To date much of the funding for OER has come from charitable foundations - the development of the OU's platform was supported by the Hewlett Foundation. However, it is clear that if OER/OEP is to become part of "normal" education practice, financial models that support the content development and storage are required. This exploration of what openness in partnership means is also an opportunity to look at the role that partnerships might play in funding openness, and an opportunity to look at OEP outside the academy. Developing partnerships is a key strategic area for the OU in Scotland; it has a wide range of partners (e.g Trade Unions, see Macintyre and Heil 2011). These partnerships are based on Widening Participation and are typically about providing routes into formal education for learners who would not otherwise have those opportunities. This institutional habit of working in partnership has been productive; it has allowed the OU in Scotland to embed materials within discrete local networks. This has been beneficial in a number of ways. It has allowed the OU in Scotland access to learners it would not have previously been able to reach, and it has led to adaptations in the support model. For example, work with Trade Unions in large Engineering works has been dependent upon and benefited from Union Learning Representatives in the workplace. They act as an important point of contact within the location for recruitment and pastoral support and this has allowed numbers growth and improved retention and progression. For the OU in Scotland this partnership approach is part of educational practice. The previous section highlighted that making content freely available can be costly, and while it may open access to content, that does not mean that it has broadened access. It also highlighted the tendency to focus on using open licences to release content from within the education sector, rather than looking at how open licences might be used to encourage and develop content across society. This observation, and along with existing educational practice informed an approach that considered the role that partnership might play in the development and use of open content, an emerging approach within open educational practices (McGill et.al 2013). The paper is based on a partnership with a Third Sector organisation Community Energy Scotland (CES). The partnership developed out of a strategic review of the OU in Scotland's position within the renewables sector in Scotland. CES contributed to the report, and community energy was identified as a key sector. The partnership formally began in January 2012, at the time CES was funded by the Scottish Government to support and administer funding for community groups interested in energy and sustainability. It did this through programmes targeted at a range of potential community led projects, from large scale income generating projects to smaller projects based on improving the energy performance of community buildings. In Scotland the community energy sector is different from elsewhere in the UK as communities interested in the larger scale projects typically own the land, and those interested in projects can purchase and manage local assets more easily. While some of these communities will take forward large scale projects, most are interested in improving the energy performance of local community facilities - known as "facilities projects". CES are a registered charity, originally a networking and advocacy group for the community energy sector, their national role developed over time as they took on and delivered more national contracts. Most of their income comes from servicing contracts for national and local government. However, the organisation also retains a focus on advocacy within and on behalf of communities, networking opportunities for communities, and Information Advice and Guidance (IAG) services. They are a distributed organisation with project officers based throughout Scotland. Their practices focus on the role of project officers who raise awareness of the potential of community energy, and provide on-going IAG on how to realise those benefits. Their organisational capacity is very dependent on those officers, specifically those officers' knowledge of practice. At the time they tended to engage with people face to face, on the telephone, or through group training sessions. In general it has tended to be a reactive service. At the start of the partnership they had started to codify those experiences into an online "how to" guide, and had created a large "toolkit" in PDF format. 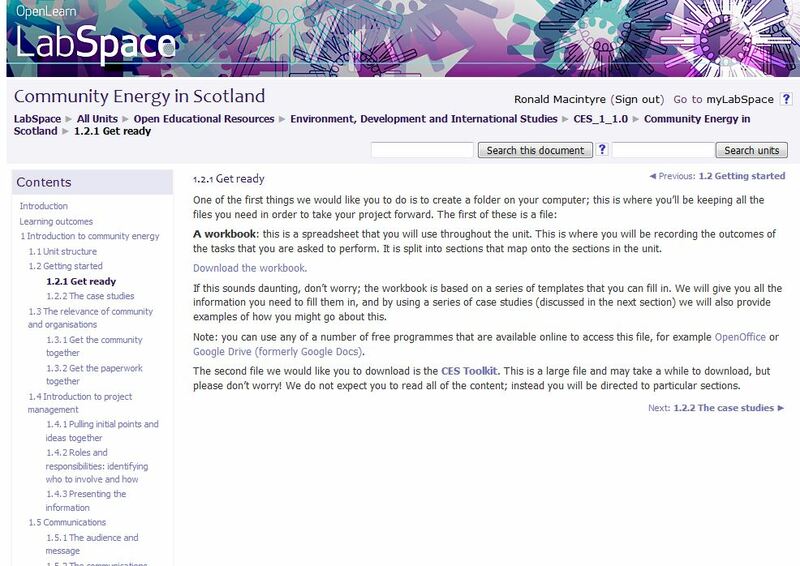 For CES the partnership with the OU in Scotland grew out of a recognition (based on user feedback) that their resources were difficult to locate and to access. The purpose of the partnership was to use openness as a means to explore these issues through re-purposing existing resources, collating and codifying organisational knowledge, to create an open and meaningful learning journey for community groups. These concerns were particularly pertinent for small groups looking to improve energy efficiency within their buildings - at the time funding constraints meant that CES ability to provide support to these groups was uncertain. The focus of the case study in this paper is the design and development of learning materials for those "facilities projects". The design and development of the materials needed to consider a number of elements. The first is a familiar one within OER/OEP and that is ensuring that any materials are structured in a way that mean they are open. Indeed it was CES recognition that their present resources were not fine-grained enough to be truly open (Masterman and Wild 2011), and the bulk meant issues around locating relevant material (Olcott 2012) that was the start of the relationship. However, as we moved from "them and us" to "we" other issues also emerged. There was the focus on content in practice to consider. We also needed to account for the fact that these complex sets of practices are not conducted by one person, they are done by groups and for the benefit of communities - they are collective learning journeys. In this section we explore what that meant for our design practices. CES were the "experts", they "knew" their "clients", and they "knew" what was required to deliver a successful project. What the OU provided was expertise in how to structure and develop a learning journey that supported those communities. This meant a co-production of the learning materials. The OU content production model is well suited to collaborative creation of content (Lane 2012). It is based on a team approach, where teams work together to create a learning journey, and with a range of authors to create learning materials. Once designed, these materials are subject to review by "critical friends". Typically teams only contain members of the academy. We wanted to ensure that CES and the OU in Scotland were equal members of the partnership. In part this related to the recognition that openness in partnership is a two way process, it was also about ensuring that the partnership "listened" to those with the expertise. Designing a learning journey in partnership with a Third Sector organisation is not part of OU standard production model - being open in this way meant we had to think carefully about our practice. Capturing CES knowledge of and how people actually developed and used knowledge and skills was crucial if we were to develop a learning journey to support those community aspirations. That knowledge was held at the individual and organisational level, often unstated, we needed to draw that knowledge out. We treated this as a design challenge drawing on thinking about design, but also drawing in participatory techniques familiar to people in community development. The development of the material was based on a series of meetings and workshops that ran over a 6 month period. The early meetings were formal and focused on relationship-building and trust. For example, one crucial aspect that needed to be addressed early on was the "business risk" associated with making organisational and effectively private knowledge public. The organisation depends on winning competitive tenders from local and central government for its economic sustainability. For a small Third Sector organisation its competitive advantage is often its Intellectual Property (IP), its staff and organisational "know how". For CES the main driver for engaging with openness was a reduction in income from central Government, the client group was no longer supported by the funding CES received, but the demand for support from those clients groups remained. Openness allowed them access to the OU's open and accessible Virtual Learning Environment Labspace, and the possibility of a more cost effective way of supporting facilities projects. However, releasing that knowledge represented a risk. Many of the early meetings were about talking through the benefits of being open, but also more generally about building that trust. That is often down to individuals. However, for CES it was also about their inherent values, and their history as an advocate for the community energy sector was important. For the staff involved this was environmentalism and the values of Education for Sustainable Development (ESD). ESD pedagogy emphasises a number of factors, the role of shared inquiry and activities, the role of practice and practical actions, collective action, and transparency (Elam and Tropp 2011; Haigh 2006; Ellis and Weekes 2008; Holbrook 2009). These shared values, and the overlap with open practices, were important as we sought "common ground". Our early discussions were about how we might take the existing content (from the toolkit) apply the principles of the 4 R's in OER (reuse, revise remix, redistribute - see http://opencontent.org/definition/) to address the challenges around granularity and findability (Masterman and Wild 2011) then render on Labspace. However, it became clear that if we were going to account for those aspects and also codify and capture the organisational, individual knowledge and experience of staff in supporting these groups then we would need to do more than simply take existing content and openly licensing it on a VLE. Early on we identified the key role that front line staff played within CES, and we wanted to engage them as creators of content. This was about accessing their "personal practical knowledge", about the sometimes invisible knowledge of social relations, existing practices and being open and flexible enough to look at developing education materials built on existing practices (Catney et.al 2013). The idea of the design space, the physical location, the present work and experience, and the range of possible "what works solutions" was useful (Sanders and Westerlund 2011), as it helped us uncover and talk about the different approaches we might take to the design process. We held a series of workshops in the CES offices, this location was deliberate as we wanted to ensure that at least one element of the design space (the physical location) was familiar. One of the challenges identified when working with partners who are not designers and treating them as designers is that people often lack the tools and the confidence to think of themselves as designers (Sanders and Westerlund 2011). The early workshops were about sharing stories and experiences, about uncovering those aspects of all our practices that we felt "worked" and testing them against alternative models. These collaborative reflections have been identified as an important component in new approaches to education, as we move from seeing ourselves as suppliers of content to learning designers (Mor et.al 2012). Once we had spent time together building up trust we started to look at the learning journey itself. Thinking ourselves as a team of designers helped. It helped us consider how we design for openness (which drew on existing practices), however, it also helped us identify the other aspects that needed to be considered, and explore potential solutions to these design challenges. These learning journeys have a number of different components, requiring a broad range of knowledge skills and experience. For example, typically having identified a need to consider energy in their building a community group will need to; analyse bills, conduct an energy audit, inspect the building and look at feasibility of different options, consult with the wider community, raise finance, select and manage contractors, and conduct on-going monitoring, a complex suite of practices that cut across normal disciplinary boundaries. This presented two challenges, one around how we might capture and make explicit those complex practices, and one around how we might design a learning journey that supports those practices. For these communities the purpose is not to acquire knowledge only for itself, but to make material changes to the fabric of a community building to improve its energy performance. This practice element means recognising that learning facilitates and is in turn facilitated by "doing" (Sorensen 2009), and asks us to consider how the pedagogical design supports those socio-material practices. For users of the content the knowledge and skills are applied to a series of tasks. Learning is through "doing", engaging with techniques and technologies in the material world (Fenwick et.al 2011). Learning is shaped by those material relations and the material fabric of the building is in turn shaped by what has been learnt. The material fabric of each building is different, and drawing on existing support practices CES wanted to emphasise the important role of their Project Officers in contextualising content and mediating material relations - a theme we return to later. As a learning provider the OU in Scotland was familiar with this reading of learning practice, as it is part of a supported open learning model. While this draws on familiar practices of what it means "to do" open learning, the context extends our sense of OEP, it has moved beyond the practice of openness within the academy, or of our partners, and begins to consider how open practice informs material practices. This is a type of facilitated "inquiry based learning" (Scanlon 2012) with very tangible outcomes. As we developed our collective understanding of the components required for a community to improve the energy performance, we realised that as the learning design structured "enquiries" and guided tasks, it also needed to provide a way to record and analyse "data". The most elegant design solution would be to embed data collection into the web portal - something that would have allowed us to track and account the 4R's of openness. However, CES emphasised portability was important to communities practices, this was not a solitary learning experience in front of a computer, but practice based social and material relations, often conducted in places without digital infrastructure. Something that mirrored the OU concerns about the degrees of freedom offered by different readings of the open in OER, in particular digital inclusion (Lane 2009). We created a spreadsheet along with various other templates that could be downloaded, adapted and shared between individuals in the group and with the wider community (see Figure 1). The users themselves create content as they complete tasks. Work on "inquiry based learning" emphasises the role that this approach to having people structure their own investigations has in embedding knowledge and skills (Lee 2011; 2012). It was our sense that these objects would become socialised within the community. The socialisation of these mediating "learning objects" (Liu et.al 2012) within the group, the geographic community, and the wider CES community, helps support the development of peer learning communities. Building peer communities has been strongly linked to developing awareness of energy and sustainability (Crook and Macintyre 2011). Having selected a "simple" and portable solution for capturing the data we now needed to look more closely at how we would facilitate the collection of the data. Exploring this with our partners we looked at how a persona or scenario's (Holtzblatt and Beyer 2013) based approach might help us. We asked project officers to use their experience to write up a series of "imagined communities". Together we then explored and talked through the assumptions and identified the key practices. It became clear that issues around sustainability are at once about practical technical concerns, and social factors, they are by their nature interdisciplinary (Barry et.al 2008). The everyday practices of CES project officers and communities are concerned with material and technical problems and solutions, scientific knowledge and social cultural and political factors, they are by their nature interdisciplinary, and the learning design needs to account for that. One thing that also became apparent through the development of these scenarios was that these are not individual learning journeys. Each person within the group takes a different role and uses different resources. Learning is shared, in terms of the knowledge and skills required, and also the outcomes. Within our "imagined communities" we allocated different sets of existing skills, and different roles of different people in the community to illustrate the different ways people might use the resources. This means resources whose "granularity" and flexibility accounts for collective learning journeys and facilitates those inquiries. The persona approach and the use of online content that could be taken offline suggest a "typical" self-supported learning journey. However, these learners are rooted in practices and in the world. The material fabric of each building would differ and while the spreadsheets allowed people to account for those differences, it was clear that people may also need face to face support. In addition, and perhaps more importantly, these projects rely in Government funding, and those structural supports vary over time. The decision was made to "build in" support from CES Project Officers. In part this was based on the experience of CES, but it also builds on research into to the community energy sector that explores individual and community motivations. Research in this area has found that social movements and mobilisation often requires groups that can mediate and interpret the political and financial barriers, and enablers, in particular as those structures are subject to frequent changes (Bomberg and McEwen 2012). This paper is about the design process. However, these materials are meant to be used in practice. Although the main focus of this paper was the design process, it is also important to see how these materials have been used in practice. This section provides information about their use. The "beta" materials were uploaded in August 2012, and were launched in November 2012. Between August and January 2013 the site had around 5000 page views. These were crude measures. For the more recent post launch site statistics (up to the 1st of June 2013) we have stripped out all the users who are clearly Open University related, and tried to look a little more closely at exactly what users have been doing with the material. The headlines are shown in Figure 3. 99 of the downloads are files, though it is not clear which files as that is not logged. The resource views are logged, of the 63 views the majority (26) are for the workbook. We have a record of 372 course views. While this tells us loosely how often is has been viewed, and for example, that people are downloading the "mediating" object (the spreadsheet), our choice of a spreadsheet (made for accessibility reasons) does not tell us how it is being used, or shared. The lack of log in and the unreliability of IP addresses as an analytical tool make it difficult to understand exactly how well our design supported the 4R's of openness. As has been noted elsewhere the open nature of the materials makes it difficult to assess how useful they are in practice (McAndrew and Cropper 2010). A further challenge was the time-scales involved. We recognised that in community energy projects, 18 months to 2 years is considered "quick". For example, in November 2012 we began a conversation with a Local Authority that was using locally available funds to support "facilities projects" in its area. The local authority staff members used the materials to learn more about community energy and are working alongside local CES staff to raise awareness. They hope to have groups "up and running" by Autumn 2013, and are happy to work with us to explore how the resources can support the learning journey of those communities. Being open in this way and evaluating that openness over those time scales has significant resource implications. Our design intention was that these materials would be used in conjunction with CES "front line" staff, and that we would be able to track how they were used in practice through our relationship with the organisation, using those experiences to update the materials - a rolling beta. Our understanding of how the materials would be used by communities in and for practice was mediated by CES. However this has not been the case. Like most Third Sector organisations CES are caught in an ongoing cycle of funding applications. In February 2013 it became clear that the organisation's focus was on grant applications, and explorations of how these materials were used in practice was dropped. For the evaluation this was a major issue as CES were the "gatekeepers" to those communities and the design of the materials was based in a "supported model". However, in Summer 2013 CES re-engaged with the partnership. Together we set out a strategy to explore how we would evaluate the use of the resources. The first part of that evaluation was a survey of front line staff (n=17) followed by "opt in" interviews, and the second part a survey of community groups followed by a suite of interviews. Only the first part of the process is reported here. 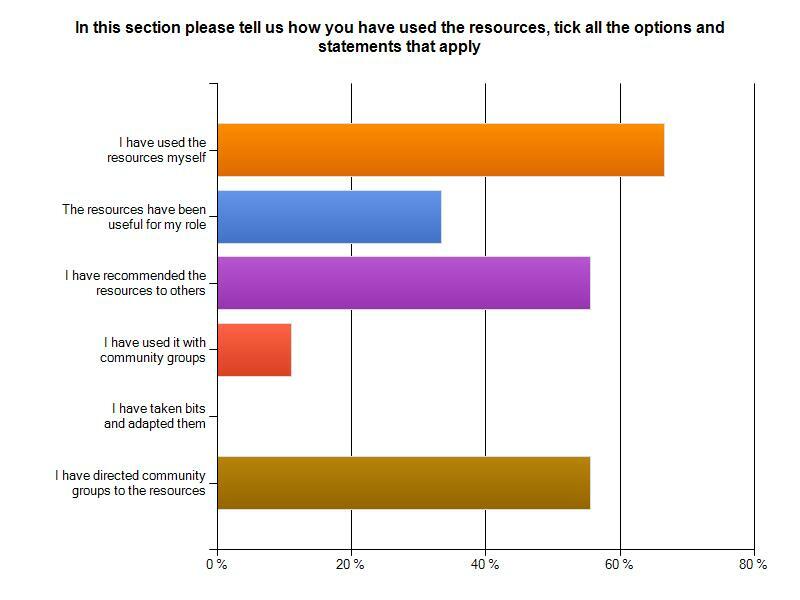 The staff survey asked if staff were willing to be interviewed and a small section of staff (N=3) were interviewed to explore how the materials were used in practice. We also returned to the senior management (n=1) and some of the original writing team (n=2). 76% of staff replied to the survey, the results are reported below. It found over 90% had heard of the resource, and 75% had used the resource. The survey asked those who had used the resource to indicate the types of use they had made of it. In the survey the dominant use seemed to be 'personal study', followed by 'recommended to community groups'. In the interviews when asked about how and whether Project Officers had used the materials in the way they were designed, to facilitate inquiries supported by them, none of the interviewees had done this. Instead, what they tended to do was direct any community facility projects to the unit as a self-study resource, and then point them to another large national energy charity who might be able to support the process through advice on business loans for energy improvements. The principal role of one of the interviewees was supporting community energy initiatives in areas of multiple deprivation, they indicated that for those clients the value of the material was uncertain. In their experience, while some of the groups supported by other officers were motivated by environmental and economic factors to improve the energy performance of their building, most the groups they worked with simply wanted direct and "hands on" help from CES to reduce energy costs. Figure 5: Front Line Staff and "How they Find Things Out"
The survey also asked what kind of information seeking behaviours people preferred and their experience of education. We found that social searching (asking other people) was dominant as was the use of the internet (Figure 5). Above we noted (see Figure 4) staff were using the content themselves, and signposting it to colleagues in other development organisations. For example, one interviewee who was from a business background, indicated that they "studied" the resource in August 2012 as part of their induction. It was useful to them as they wanted to access introductory materials for work related reasons and had no need for credit. Here open practice is supporting Continuing Professional Development (CPD), this chimes with our conversations with local government who have also been using the content as CPD. These project officers and related development officers are often physically remote from each other, or remote within their organisation, and thus may be distanced from professional networks and access to CPD. Reflecting on the interviews and the design process and discussing this with CES the suggestion is that what we created was produced by professionals, and perhaps for that reason is actually most useful and used by professional development workers, rather than the volunteers we had sought to support. Having looked at content in practice, let us return to CES and partnership in practice. Originally our partnership was based on mutual trust and understanding, it was built up through the design workshops and seemed to us to be based on shared values around ESD and being open. The context for disengagement at a strategic level was uncertain funding. We found this at an operational level as well, with the loss of funding (in 2012) for facilitates projects and the loss of core funding from central government having a profound effect on staff. There was a great deal of uncertainty over whether front line staff would "keep their jobs". In this context innovations around partnership and openness along with servicing unsupported client groups (like facilities projects) was no longer a priority. What is the context for re-engagement? It appears that the economic uncertainty surrounding the organisation has led them to explore alternative business models, and they have become interested in the business of being open. There are clear parallels in this narrative with the tensions between the altruistic and the self-interested narratives that surround openness within the academy (Olcott 2012). Being honest and open, from the OU in Scotland's perspective the genesis of the partnership was a strategic review of the renewable energy sector in Scotland. It identified community energy as a key sector with which other HEIs' had yet to engage, we identified our experience of learning design as a key strength, and used openness as a way to enter the sector. It was our attempt to use "public" and "open" to colonise and lay claim to a particular strategic area. Having lost most of their funded service function, it may be CES motivations are similar; they want to "make public" their knowledge of the area. Our most recent discussions with CES have focussed on the business of openness, how they might utilise OER as a resource and wrap "paid for" services around them. Part of this rolling beta is not just applying the lessons to this partnership, but to openness in partnership more generally. Partnerships take time, and while this is a lesson we know about from our other work (Macintyre and Heil 2011), it is clearly a lesson we still need to learn. On reflection it now appears foolhardy to initiate a partnership through the creation of shared content, even if those failings may (as noted above) develop and grow into something positive. The other lesson we draw is identity of our partners. It is clear that allowing CES to mediate and interpret our interactions with the potential users of the content was useful for us, in that it reduced our upfront costs, but our engagement with and ability to evaluate how the resources were used and reused in and through practice was compromised. We have begun to address these aspects in our more recent projects. For example, based on a long term study of how social housing residents learn and adapt to low temperature heating systems (Macintyre et.al 2013) we are aiming to develop OER that support social housing tenants transition from high to low temperature heating systems. Our own research in this area started with the premise that people are experts in their own lives and this naturally leads to an approach to Information Advice and Guidance (IAG) that privileges and attempts to capture that expertise for the benefit of others. This is of course part of learning design, and we draw heavily in emerging ideas within ESD which emphasise the tendency within environmental education to focus on a "deficit model" of education, where interventions assume that peoples "bad behaviour" relates to knowledge that we can "pour in" (Catney et.al 2013). Based on this we have been working with a local authority and a charity to develop OER to support effective transition to low temperature heating systems. We are at the early stage of this work, however drawing on our CES experiences we are working directly with the end users as authors of content. They are our partners. We still focus on co-operatively designing materials (Sanders and Westerlund 2011) within workshops that support and develop people's sense of themselves as designers (Mor et.al 2012). However, this time it is based on a long term and existing partnership with the end users, and we also understand a lot more about the practicalities of being open in practice and in partnership - something that this paper has attempted to make visible. Of course this has costs, but it is our sense that it is a more sustainable approach. This partnership has informed our understanding of OEP in a number of ways. On first reading the partnership provided privileged access to learning through and for practice, and extended our understanding of what OEP means into material practices in the "real world". The focus on material practices and the requirement to consider aspects of openness offline has informed our approach to working with social housing tenants to create materials around energy and fuel poverty, asking us to consider the socio-material and "learning by [for] doing" (Sorensen 2009). This also encouraged us to shift away from seeing learning as a thing that is done and assessed individually and explore what it means to learn collectively, common in community development, and the workplace (Collin and Valleala 2005), less common in HE, but perhaps required as policy makers look closely at HE's socio-economic role. In addition it shaped our understanding of the social role of HE, as such it is part of a clear shift to explore what openness means outside the academy (McGill et.al 2013). Specifically it asks about power, and whether present open policies and practices within HE are merely (re)creating openness in its own image - as owner, creator, or curator. Partnerships ought to shift the focus. Clearly new models are emerging that through partnership destabilise the idea of the academic author and authority within the design of content (Coughlan and Perryman 2013). Not just onto different sets of knowledge, it is also about the business of openness. From a business perspective the OU in Scotland offers a partner expertise in designing and developing material, and a robust platform - often a barriers to making material open and accessible (Lane 2012). At first the value of the proposition to the Third Sector is less apparent. Even though it may fit in with "the ethics" within voluntary organisations, their Intellectual Property (IP) is important, especially as Governments look to outsource to Third Sector who competitively tender for contracts. However, what we are discerning from our own work is that (just like in HE) Third Sector organisations are beginning to see openness as a source of competitive advantage, as it allows some organisations to appear to be the "natural" place to go for certain services. One of our original goals was to look at how working with partners outside the academy might make the development OER and OEP more sustainable and more relevant. What we have found is that there is a role for partnership, but that role is not simply as about bringing in new materials, new markets and new finance. This paper suggests that open is not simply about content and licensing, it is also opening up educational practices more generally. Bomberg, E. and McEwen, N., (2012). Mobilizing Community Energy. Energy Policy, 51 (1), pp. 435-444. Catney, P., Dobson, A., Hall S.M., Hards, S., MacGregor, S., Robinson, Z., Ormerod, M. and Ross, S., (2013). Community knowledge networks: an action-orientated approach to energy research. Local Environment, 18(4), pp. 506-520. Coughlan, Tony and Perryman, Leigh-Anne (2013). Beyond the ivory tower: a model for nurturing informal learning and development communities through open educational practices. Revista de Universidad y Sociedad del Conocimiento (Globalisation and Internationalisation of Higher Education), 10(1), pp.312-326. Elam, E. and Tropp, T., (2011). ESD Pedagogy: A Guide for the Perplexed. Journal of Environmental Education, 42(1), pp. 43-64. Ellis, G. and Weekes, T., (2008). Making Sustainability "Real": Using Group-Enquiry to Promote Education for Sustainable Development. Environmental Education Research, 14(4), pp. 482-500. Haigh, M.J., (2006). Promoting Environmental Education for Sustainable Development: The Value of Links between Higher Education and Non-Governmental Organizations (NGOs). Journal of Geography in Higher Education, 30(2), pp. 327-349. Holbrook, J., (2009). Meeting Challenges to Sustainable Development through Science and Technology Education. Science Education International, 20(1-2), pp. 44-59. Lee, V.S., (2011). The Power of Inquiry as a Way of Learning. Innovative Higher Education, 36(3), pp. 149-160. Lee, V.S., (2012). What is inquiry-guided learning? New Directions for Teaching & Learning, 2012(129), pp. 5-14. McAndrew, P. and Cropper, K., (2010). Open Learning Network: the evidence of OER impact, In: Open Ed 2010: The Seventh Annual Open Education Conference, 2-4 November 2010, Barcelona, Spain. Creative Commons are presently exploring the possibility of inserting meta data in "learning objects" that will allow creators to track the 4R's more effectively, personal communication Dr Cable Green, Creative Commons, 27th of June 2013.